These stunning light blonde tresses are worn over the shoulders showing off the beautiful waves dressed through the mid-lengths to ends for shape and movement. This hairstyle is easy to re-create with rollers or a curling iron, and needs product for shine and hold. Regular trims is needed every 4-6 weeks to prevent split ends. 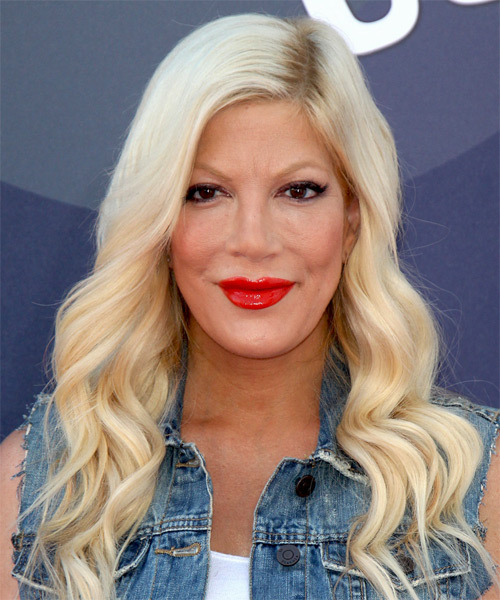 Tori Spelling goes for the ultimate California girl look here with long blonde beachy waves. This hairstyle is perfect for summer and the â€˜do of choice for many Hollywood starlets thanks to its high glam factor. Tori has an oval-oblong combination face shape which benefits greatly from this â€˜do. The deep side part minimizes excess length in her face, and the large beachy waves give her hair volume while creating a gorgeous frame for her face. Toriâ€™s color is another covetable feature of this â€˜do. Her icy white blonde hair color is not only perfect for the summer months but it is right on trend this season. Ladies with a fair, cool skin tone will suit this color the best but it will also work on warm or tanned complexions, as Tori demonstrates here. Tori Spelling is an American actress and author who first shot to fame on the series â€œBeverly Hills 90210â€.